Dr. Payne began his pre-med education at Northwestern Michigan University where he studied the basic sciences such as inorganic chemistry, organic chemistry, biology, along with basic physiology and anatomy courses. After completing his study there, he was accepted at Life Chiropractic College in Marietta GA. During his four years at Life, courses included biochemistry, a major emphasis on anatomy and human physiology, X-ray, diagnosis, chiropractic adjusting and techniques. 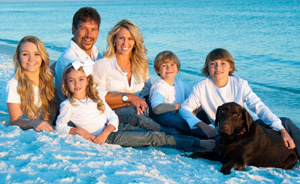 After graduating in 1993 Dr. Payne and his wife Juli moved to Destin, Florida to establish his practice. Dr. Payne is married to Juli and they have four children, Makayla, Jacob, Nathan, and Alyanna. All four children were born at home and the last three were water births. Juli chose to have water births at home in a birthing pool called an AquaDoula. None of the kids have ever received a vaccination or an antibiotic. Dr. Payne specializes in the Gonstead Art of Chiropractic, and Pediatric Chiropractic techniques taught from Dr. Larry Webster. Thank you for visiting our site. I hope it can be a source of hope and healing. Ready to get started? Please call our Destin office to arrange a time so that we may meet you and discuss your particular health issue.